The barque Killoran sets sail off Port Victoria in Spencer Gulf, South Australia with a heat haze building up astern. Her black hull indicates ownership by Finnish shipowner Gustaf Erikson who bought her from Glasgow shipowners, J Hardy & Co, in 1924 when she had painted ports, a feature of British owned sailing ships. 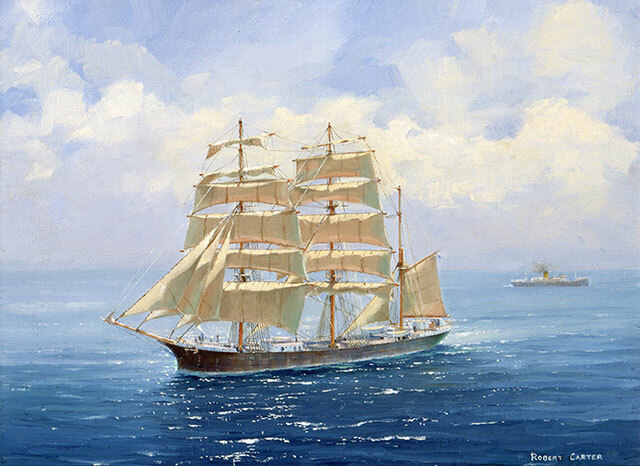 Spencer Gulf had a long association with the sailing ship, brought about by its unique configuration, allowing ships to load deep within the grain-producing countryside. The towns and ports around the Gulf began developing from about 1850, with produce and necessities being transported by hundreds of ketches, schooners and barques from other parts of Australia and overseas. Sailing ships could make and leave anchorage or their mooring at the long jetties that were a feature of some of these ports without the aid of tugs. The first sailing ship to load a grain cargo at Port Victoria was the ship Carlisle Castle in 1879. 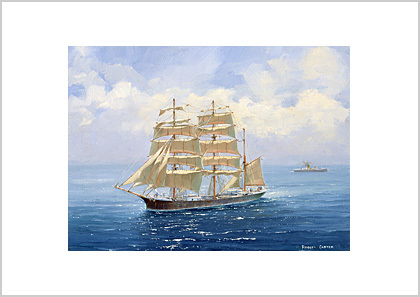 The barque Killoran sets sail off Port Victoria in Spencer Gulf, South Australia with a heat haze building up astern. Her black hull indicates ownership by Finnish shipowner Gustaf Erikson who bought her from Glasgow shipowners, J Hardy & Co, in 1924 when she had painted ports, a feature of British owned sailing ships.